Angie's mare, Saffron, was going through labor. Her dad had warned her that Sassy, as she was more commonly known, might not live through it. She could recall his words exactly. "Angie," he had said, "Sassy's old. She's lived long enough." And he had left it at that. And Angie did not want the mare to die. Foremost, because foals usually die without their dam, but also because she had had Sassy since before she could remember. 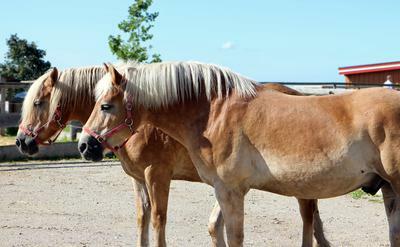 The sire, Arcturus, was a dappled gray, and Sassy was a golden palomino. Arcturus had been a racer, before a hoof injury nipped his career in the bud. However, he was sought after for breeding because of his speed on the track. Sassy had a gentle disposition, always cool as a cucumber. What Angie was hoping for was that the Arcturus's dapples and Sassy's golden coat might come out in the foal. She already had a name picked out: Dappled Gold. It was too much to hope for that Arcturus's speed and Sassy's disposition might come out in the foal. That would be just too magical to be true. Angie could feel Sassy slipping away, each breath coming harder, but she was too dazed to even think. For here she was with not one, but two foals in her arms. "Come Angie," her father said gently, "Saffron's dead. But these are beautiful foals. And look, there's your Dappled Gold! It's a colt, and he's everything you wanted, dapples over a golden coat. And this one here is his sister, a beautifully light gray little filly." "You know what, Dad? I'm going to name her Starshine." "That's the perfect name. Now, you run back to the house and go to sleep. I'll take care of the foals." Angie left the foals with her father and walked back to the house, still in a daze from all the things that had happened, so the full meaning of everything didn't really sink in until Angie reached her room. Then, like a wave, it washed over her, and she threw herself upon her bed, sobbing. Sobbing for Saffron, for the foals that might not live, and for reasons she couldn't think of. When she was done, she felt very tired, as crying often makes you feel, and fell asleep almost immediately. She dreamed of horses galloping through a green, green field, racing on big tracks with hundreds of people watching! When Angie woke up in the morning, her first thought was of the foals. She dressed and went downstairs. It was early, about 6 in the morning, so she was surprised to meet her father out in the barn, as he usually didn't come out until half an hour later. "Hi there, Angie." he said cheerily. "Sleep well?" "Yeah, I guess so." Angie replied. "Where did you leave Saffron?" "We left her over there, by the large oak. I thought you might want to bury her there too." "Yes. She always liked grazing over there. We'll do that after breakfast." "Alright." Mr. Benson came over and gave his daughter a hug. As if reading Angie's mind, he said "The foals are in their mother's stall." Angie sat in the large box stall, in one corner, watching the foals opposite her. She held out a bit of carrot in one hand. "Come on," she crooned softly, "I don't bite." The sound of her voice seemed to calm them, for Dappled Gold took a tentative step towards her. "Come on, boy," she continued to murmur, "I won't hurt you." He reached out with his neck, and his lips quickly snatched the piece of carrot from her palm. Angie turned her hand around, so her fingertips were now pointing up, and was rewarded with the feel of a velvety muzzle pressing against it. "Good boy," she said, feeding him another piece of carrot. By this time, Starshine had crept up next to her brother, and had an expression on her face that clearly asked 'where's mine?'. Angie laughed. "Here you go," she said, holding a carrot out to the little filly. Starshine nuzzled her hand, looking for more. Angie relented and slipped her one more carrot. "Angie, you alright?" her father poked his head over the stall door. "Wow, you're making good progress with those foals. Mom told me to tell you that breakfast's ready." "Okay." Angie stood up and dusted the hay off her pants. "I'll come back soon." she said to the foals. When they got back to the house, one looked at the heaping stack of pancakes, the jugs full, one of juice, and the other of milk, the two plates holding bacon and breakfast sausage, the big bowl of whipped cream, the pitcher of maple syrup, and the butter dish with the beautifully golden butter inside, and they both gave a huge sigh of satisfaction. "Wash up first," Angie's mother threateningly said, holding up a wooden spatula. "And I'm only half joking." she said with a smile. After Angie had eaten 2 of her mother's huge blueberry pancakes, one with whipped cream and one with butter and maple syrup, 3 sausages, and 2 pieces of bacon, and drank a full glass of juice, she hugged her mom, said 'thank you for breakfast', and washed her plate, she went back out to the barn. "Hurry up Mom," she said, "I want to bury Saffron and pass on." At the shocked look at her mother's face she said hurriedly "Oh, I didn’t mean to be rude. I was just saying..."
"It's okay. I'll be out soon. But after we bury her then it's time for school!"